^ a b c Watkins, William A.; George, Joseph E.; Daher, Mary Ann; Mullin, Kristina; Martin, Darel L.; Haga, Scott H.; DiMarzio, Nancy A. February 2000. 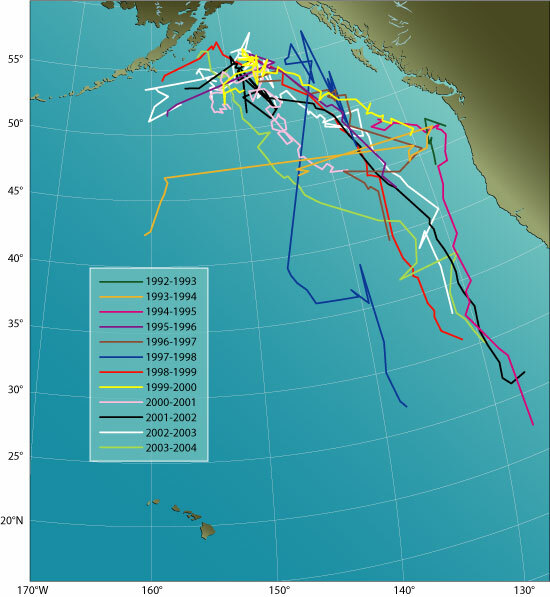 "Whale call data for the North Pacific: November 1995 through July 1999 occurrence of calling whales and source locations from SOSUS and other acoustic systems". Woods Hole Oceanographic Institution. Technical report. WHOI-00-02. Watkins, W. A., M. A. Daher, G. M. Reppucci, J. E. George, D. L. Martin, N. A. DiMarzio, and D. P. Gannon. 2000. "Seasonality and distribution of whale calls in the North Pacific". Oceanography 13:62–66. Watkins, W. A., M. A. Daher, J. E. George, and D. Rodriguez. 2004. "Twelve years of tracking 52-Hz whale calls from a unique source in the North Pacific". Deep Sea Research Part I: Oceanographic Research Papers 51:1889–1901.